Beatles FAQ: Why was the Walrus Paul'? John Lennon cheerfully admitted that he had had 'no idea' who or what was the 'eggman' was in 'I am the Walrus'. But it doesn't sound very affectionate. The 'sour A minor melody' and snarling tone of the song suggests a different message. Glass Onion is a sullen two-fingered gesture against the listener ('you all'). 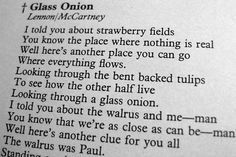 Interestingly, Glass Onion was a genuine collaboration between John and Paul. 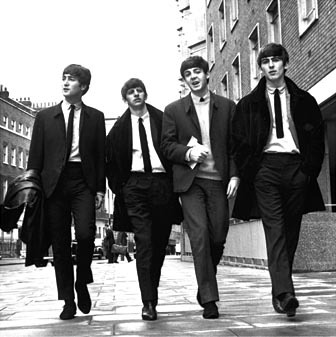 The theme (an attack on the 'pseuds' over-interpreting Beatles' lyrics) sounds typical of Lennon but in fact came from McCartney. Their relationship was fraying but here they come together in a howl of complaint.